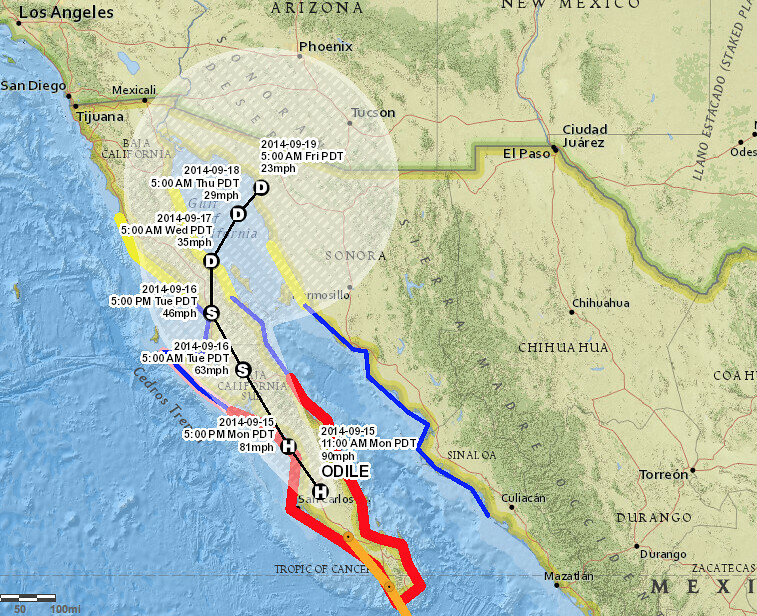 A week after Phoenix saw it’s wettest day on record, the southwest is gearing up for another round of heavy rain and flooding from now Hurricane Odile, spinning into the Gulf of California. Current modeling takes the heaviest precipitation southeast of the Phoenix area, but flash flooding concerns across much of Arizona and New Mexico will be heightened for the second half of the week. Here’s the rainfall forecast from the GFS through 00z Saturday (EURO looks similar), a swath of greatest totals across southeast Arizona and western New Mexico. Is this amount of moisture for the region normal for this time of year? No, but also not unheard of when the eastern Pacific is active. We’ve discussed at several opportunities this summer our expectations for enhanced eastern Pacific hurricane activity and sure enough, that is panning out. Take a look at the PWAT anomalies forecast for the second half of the week across the southwest, well above normal. 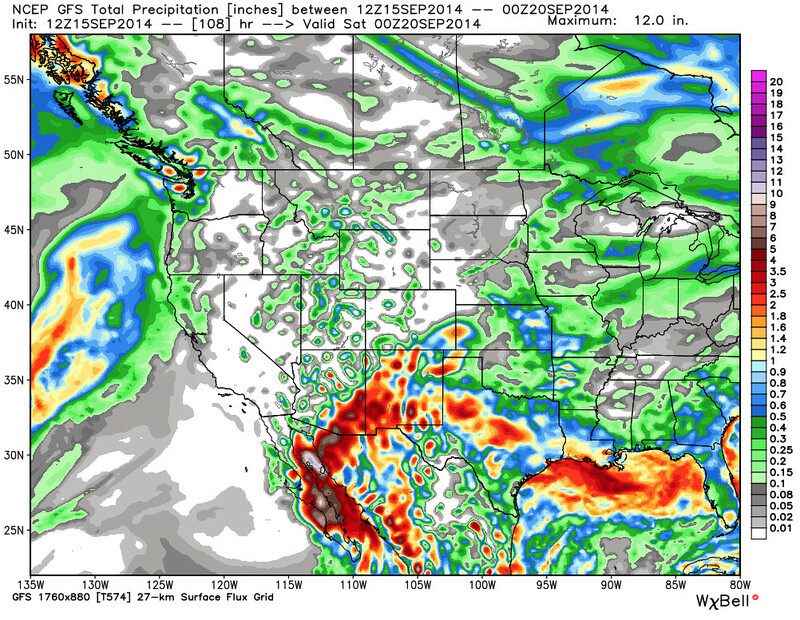 Southern Colorado will also try to pick up some beneficial moisture over the next week. At the present, it appears areas south of the Palmer Divide will have the greatest chance at seeing increased shower activity through the weekend -- but we’ll keep an eye on things across northern Colorado as well. For more, check out this week’s State of the Atmosphere. The eastern Pacific stays active for the foreseeable future. 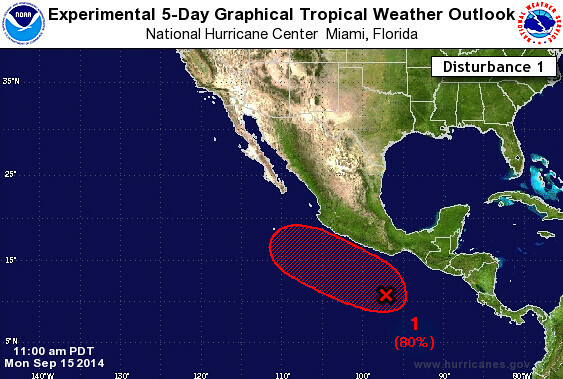 Behind Odile is another disturbance with a 60% chance for formation in the next 48 hours. Today’s 12z GFS tracks it further west than Odile, but will certainly need watching as it develops.